Hi everyone! Today is the third day of the My Favorite Things March release countdown. 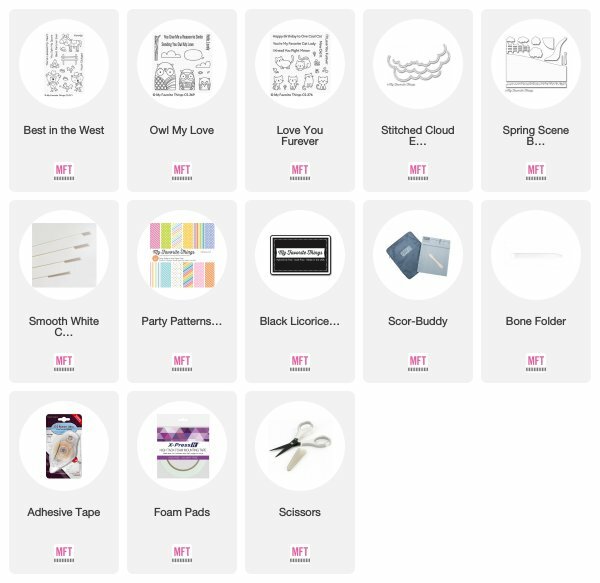 This release is packed with amazing new products and it was so fun to play with all the new stuff! The new products will officially be available on the MFT online store on March 6th at 9:00 pm EST (= Europe: March 7th at 3:00 am CET). Most of the supplies I used for this project are linked at the bottom of this post. I went for a clean and simple scene using elements form the Best in the West stamp set (bear, rooster, fence, sentiment). The bee is from the newest Love You Furever set. The speech bubble from the Owl My Love set. The clouds were die cut from white cardstock using the Stitched Cloud Edges Die-namics. The patterned paper in the background is from the Party Patterns paper pack. The grassy border is from the Spring Scene Builder Die-namics. Super cute card! 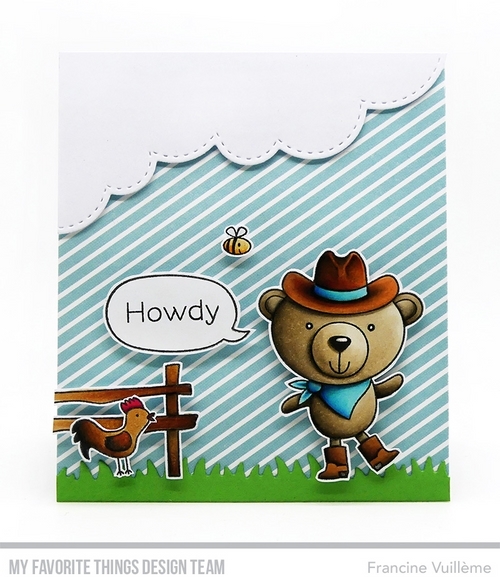 The bear is adorable :-) Love the Howdy sentiment as I use that word to say hi all the time!!! What a sweet card! I love the bears little boots. So CUTE. I love the designer paper background and brilliant coloring.